Addiction is a powerful thing. 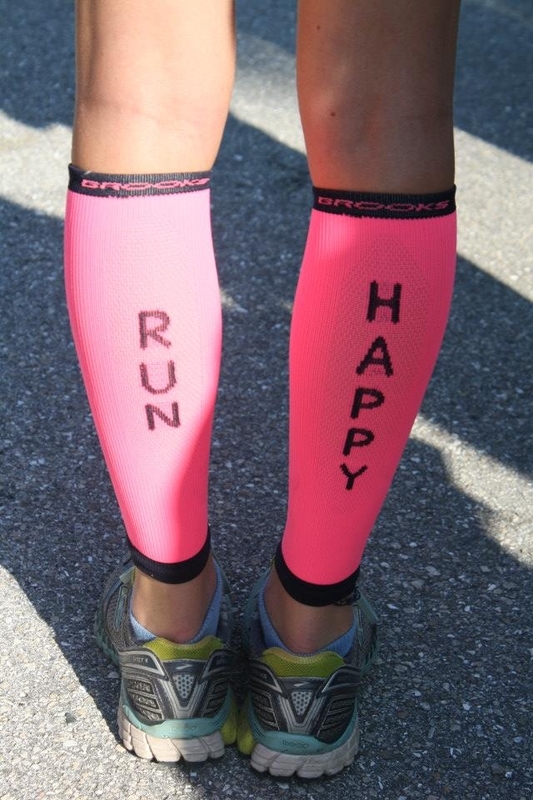 I am not sure exactly when it happened but suddenly I found myself wanting to run all the races! 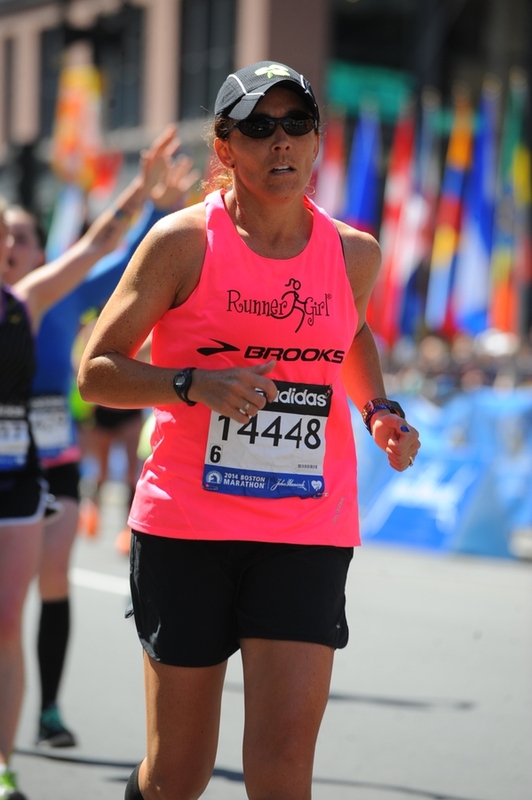 Between the Celebration Marathon in January and Boston Marathon in April, I raced nine times and even joined a new running club just so I could compete in their racing series. No wonder my hamstring injury never healed. After Boston I ran in four more races between the end of April and mid-July. I tried resting the hamstring for a week or two here and there and even went to physical therapy. Finally when I had finished the last of the Picnic Island Adventure Runs of the summer in July I decided to focus on getting healthy for marathon training. I was set to begin the 18 week Hansons Marathon Method with a group of friends at the end of July. I knew I would not be able to handle marathon training with a hamstring injury. I followed the plan almost perfectly for weeks and weeks. I turned down invitations to race, which is difficult for me to do. I even had to skip one of my favorite summer cross country races. I trained consistently and did not race for 11 weeks. I even stopped having the urge to look at race calendars in running magazines. 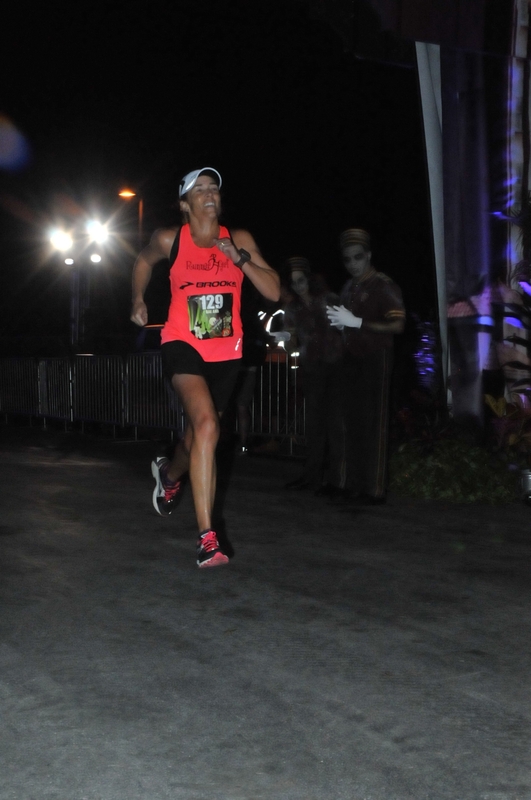 Then it was time for the Tower of Terror 10 Miler at the beginning of October. “You are about to discover what lies beyond the fifth dimension, beyond the deepest, darkest corner of the imagination, in The Twilight Zone Tower of Terror™ 10 Miler!” Thanks Disney, I was already both scared and excited for this. On one hand, I was really looking forward to it because my training had been solid and it would be a good test of my fitness. It is such a fun race; probably my favorite Disney race. But on the other hand, I was extra nervous about racing. Would this trigger my racing addiction? Would I revert back to the bad habit of over racing? I am happy to report that as of two months post-race, it has not. I have kept my racing calendar from filling up. I am staying focused on training properly and only racing when it fits in with my goals. 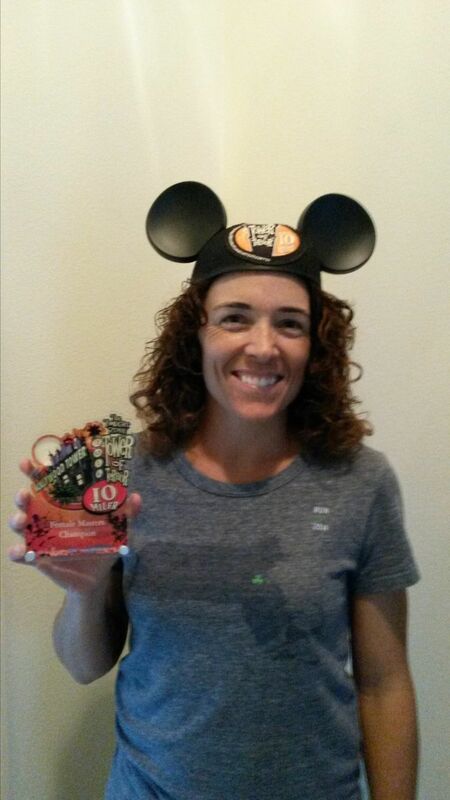 I think much of that success is due to the amazing time I had at the Tower of Terror 10 Miler. 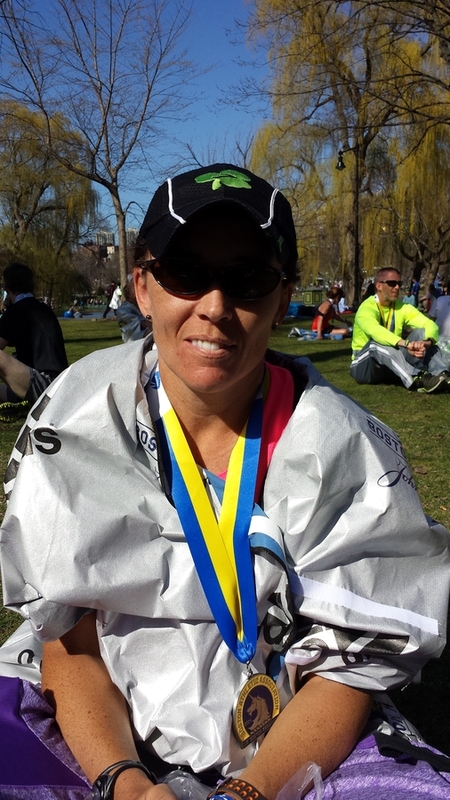 I hadn’t raced in 11 weeks so I could only rely on my marathon training paces to guide me. I started conservatively but quickly sped up because I felt so comfortable. A little before halfway I knew I could really race it. I ended up running negative splits, finishing a little over a minute off my PR that was set 12 years ago. 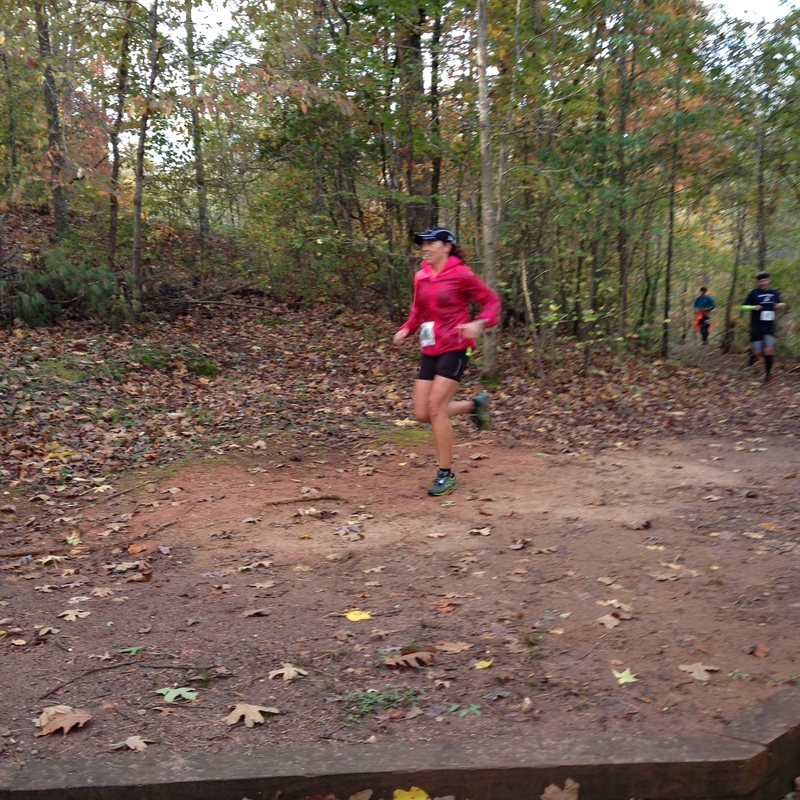 I was the 5th overall female and Masters Winner. 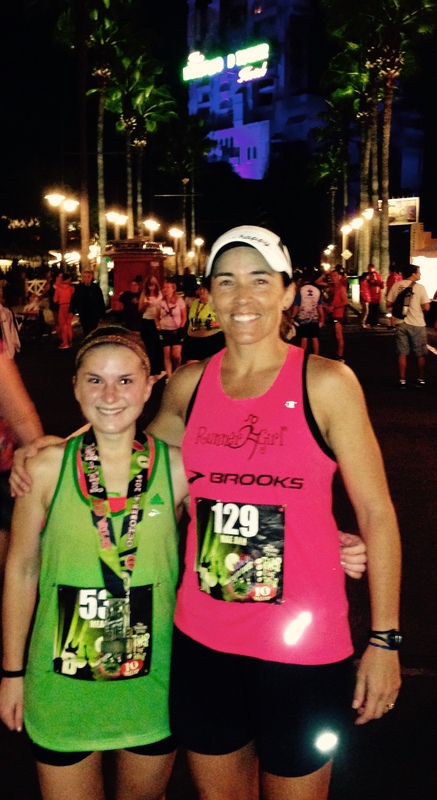 Meagan & me in front of the Tower of Terror after we both had awesome races! I am not sure if my addiction is racing, adrenalin, competition, or some combination, but let’s just say that my competitiveness does seem to carry over to other areas like Toy Story Mania (the best game/ride in all the Disney parks). Perhaps moving into the Masters category has helped me mature as a runner because I definitely learn from my mistakes and train a lot smarter. It took one great race preceded by many weeks of patience, listening to my body, and good training in addition to some serious willpower to stop over racing. Masters award arrived in the mail a few weeks after the race. 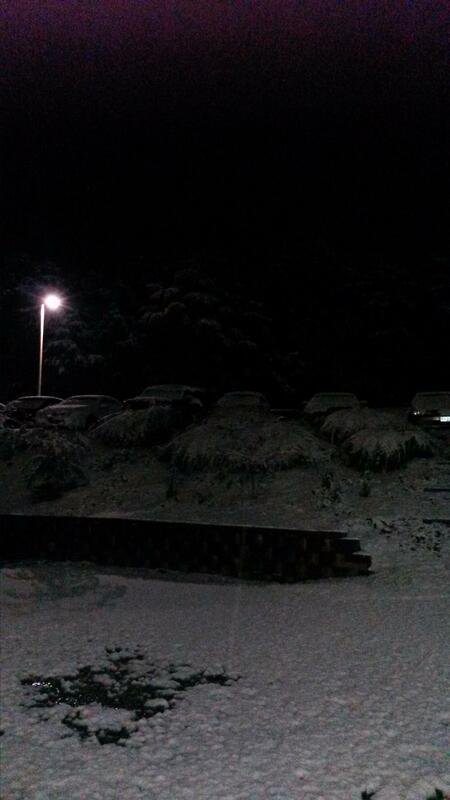 This time it was no picnic! 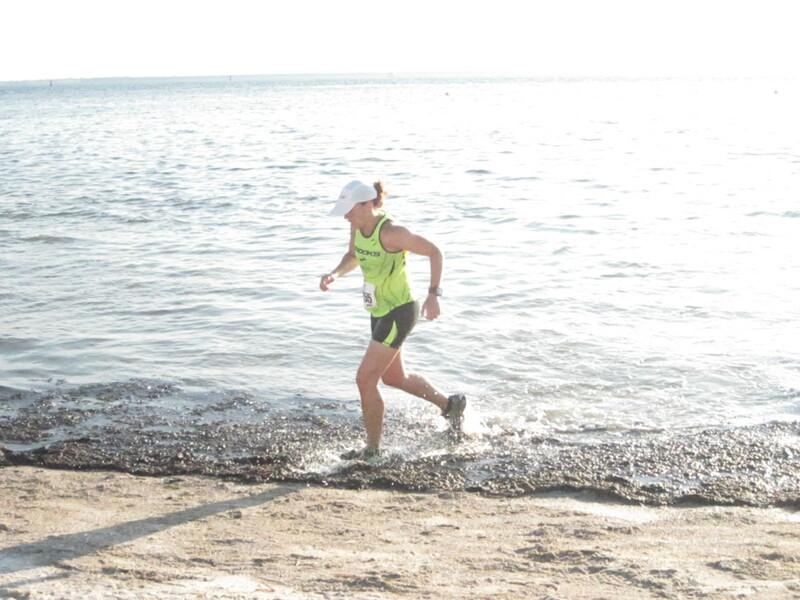 One of my all-time favorite races is the Picnic Island Adventure Run in Tampa, Florida. It is actually a series of three races that take place once a month on Friday nights in May, June, and July. Hot and humid do not begin to describe the weather at 6:45 p.m. on the small island in Tampa Bay under a cloudless summer sky. 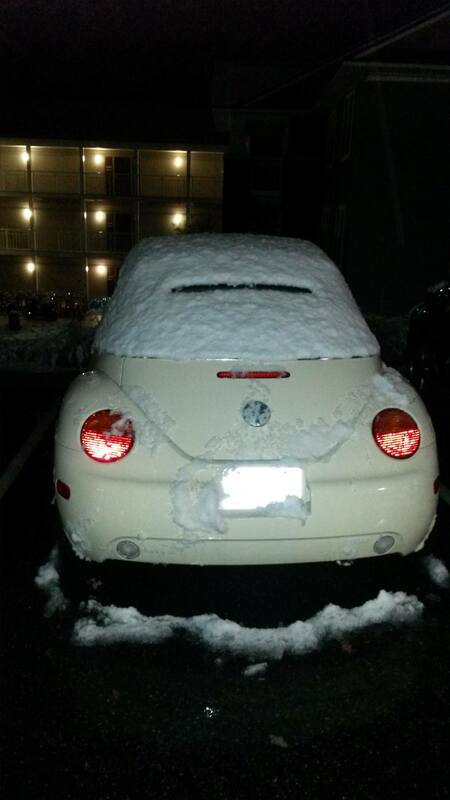 So once you’ve accepted the weather factor, you’re ready for the real challenge. This adventure run is unique and definitely not one of those mud runs or extreme obstacle races where you sign away your life in a waiver. I don’t do dangerous races like that. Picnic Island is challenging, don’t get me wrong, but it is definitely more welcoming to all ages and abilities who are seeking adventure. The obstacles are minor; you crawl under a cargo net on your knees over sand, run through six big, inflated tubes, and then hurdle, jump, walk, or crawl over one hurdle. The rest of the run is on the beach, grassy areas with hills, a couple of very small sections over pavement, and quite a bit through mangroves. Oh the mangroves! You never know what to expect until you get there. This July 18th, high tide was coming in so the water through the mangroves was pretty deep, very warm, and muddy. Yes, a little bit of “ick” factor, especially if you go splashing through like I did and it hits you in the face. I always sign up for the three race series but this year I was unable to race the May and June races due to my post Boston Marathon rest period and rehabbing an injury. I knew I was not in top shape, but was very excited to race Picnic Island as well as I could. From the gun, I was out of breath and knew I would be. I was just trying to hold on to my spot in the top five overall women as we approached the last section of “non-trails” before the toughest part of the course. I say “non-trails” because they are not trails; they are overgrown areas of vegetation that someone walked through when setting up the course and stomped down a single track area for us to squeeze through. I was almost through this section, which is my least favorite of the course, and I tripped. I had an out of body experience. I saw myself floating down towards the ground, almost as if in slow motion. As soon as my knees hit the rocks at the bottom of the slight downhill I popped up, probably cursed (can’t remember now), and quickly ran off. I attacked the five or six steep hills that zigzag up and down from the beach because I was so shocked that I fell and a bit embarrassed. But I wasn’t feeling any pain yet so I finished strong and ended up placing third overall and won Masters. Once I hosed off my legs to assess the damage, then the pain kicked in. 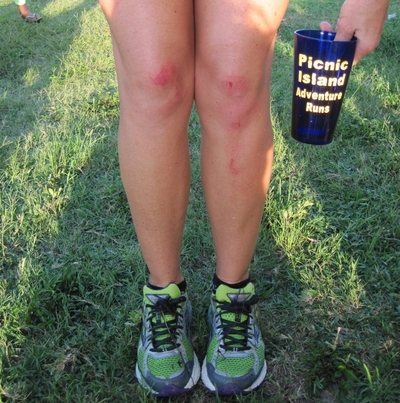 So this one was no picnic but even now, two weeks after the event, my knees are still scraped, bruised, and recovering but I cannot wait until next summer when I can run all three Picnic Island Adventure Runs! Exiting the water and heading to the finish line! After several weeks of physical therapy, cross training, and not running, I was cleared to start running again. I followed my physical therapist’s advice and literally started with five minutes of running and only increased by two minutes each day. My hamstring and piriformis were still a little painful and tight but definitely better than before I began the physical therapy and what seemed like a never ending rest period. Perhaps I was overly cautious, but I didn’t want to rush back and have another set-back. After many weeks of doing more walking than running plus my half-hearted attempt at cross training, I soon found myself heading to Dunedin, Florida in a rain storm for the July Fourth Midnight 10K Run that I had signed up for months ago. As an over racer (recovering) I tend to sign up for races very early when they catch my interest. I was excited about the overnight trip and racing at 12:15 a.m. with friends from my S2 Timing racing team and fellow Suncoast Striders but not very excited about racing ten kilometers. I purposely did not bring my racing flats or “lucky” bracelet and earring that indicate (to myself at least) that I am in race mode. I first discovered the phrase “listen to your body” when I read the many incredible books by George Sheehan, M.D. Since then it has become a regular part of my coaching philosophy. It is so simple, yet so difficult to do. Sometimes we may hear our bodies telling us that something is not quite right but do we really listen? That is the big revelation in my life recently – learning to really listen. I have realized that I cannot over race and get away with it anymore. Okay body, I’m listening! At the Midnight 10K Run I had no race plan as far as goal time or pace. Coming back from this injury I decided not to put any pressure on myself. My friend Meagan was really surprised because she has seen me on a “normal” race day and I was definitely not in race mode that night. But I was not going to utter anything pace specific before that starting gun went off. I started my GPS and went out at a somewhat comfortable pace and didn’t even look at the Garmin the entire 6.2 miles. Meagan caught up to me after about a mile or two and thought that something was wrong since she is not normally so close to me during races. I felt a little surge of competitiveness but kept my effort in that somewhat comfortable range. After the turn around she caught up to me again and was about to pass me with about two miles to go. I knew there was no way I could stay with her. I encouraged her to chase down a couple of female runners that were ahead of us. She said that she couldn’t catch them and I yelled back that she could! And she did. One of them passed her back in the last 400 meters but she still had an amazing race. She ran a new 10K PR, which is not easy to do in the hot, humid Florida summer at midnight, ran negative splits, and took second in her age group. 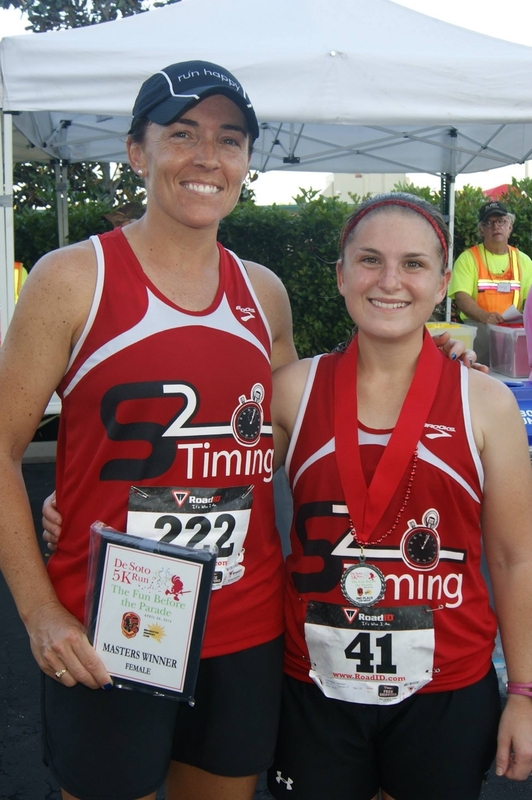 Our other Suncoast Strider and S2 Timing teammate, Diana, won overall female. I was so proud of them and so happy for them! I truly was. I didn’t care about my time or place. I did end up placing fourth in my age group but was way more excited about celebrating their success and the fact that I really listened to my body and ran within its limits that night. 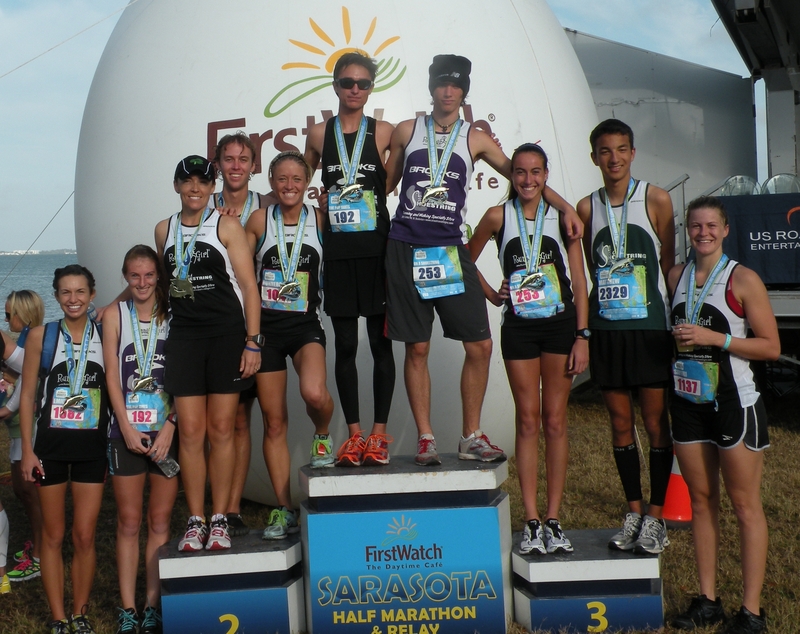 In February while racing the Gasparilla 8K in Tampa, I felt a weird painful twinge in my left thigh. It hit me about halfway through the race and would not let up no matter how I changed my stride, sped up, or slowed down. I was fortunate to be able to finish and won the Masters division. 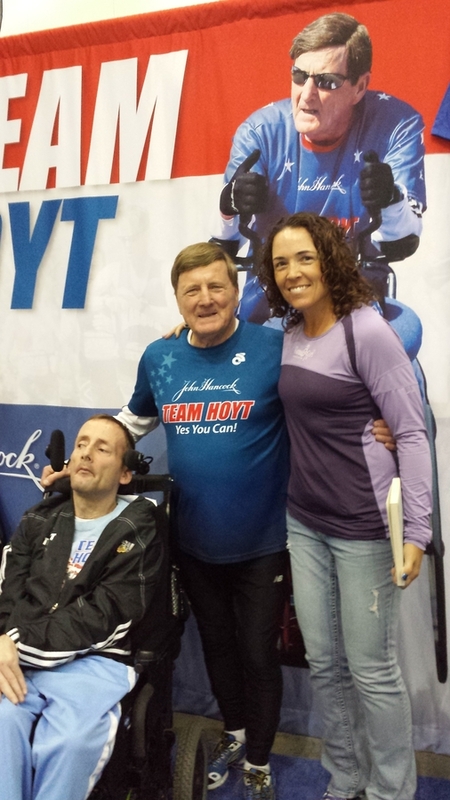 I was definitely concerned about the pain but with only eight weeks to Boston, I could not afford any time off. I continued training and racing and racing and racing. Confession: I raced way too much this spring. With over ten years of coaching experience and 28 years of training and racing experience, I should know better. Yet here I am making this major rookie mistake. I think I have become a race adrenaline junkie. I made it through the eight weeks of training with consistent hamstring pain which also hurt quite a bit during the Boston Marathon. After Boston I took five days of complete rest before the DeSoto 5K in Bradenton that Saturday night. I had committed to run it for my racing team, S2 Timing, and I had also challenged my track team that if any of them beat me, I would treat them to frozen yogurt but if I beat them, they would treat me. They definitely had the advantage since I was just five days off a marathon. I was hesitant to race but decided to just go out comfortably and not push that hamstring at all. I ended up running negative splits, finishing second female, and winning Masters. And let’s just say that I am getting treated to frozen yogurt sometime soon! Two of my track girls set new personal bests that night, which was fantastic. I was making excuses for why I won Masters – it was a very small race, my time was not that great compared to what I usually run, etc. I took another week off from running to rest that hamstring but had another race commitment the following Saturday with the S2 Timing racing team (which I am incredibly grateful for!). For the Miles for Moffitt 8K in Tampa, I had the same mentality going in; I would go out comfortably and let the hamstring pain dictate my pace. I finished sixth female, second Masters, and just missed winning Masters by six seconds! I think my friend Meagan’s comment was “you’re ridiculous” or something like that. I started making excuses again saying things like I only placed because I’m over 40 now, and then she stopped me. I should not make excuses for how or why I placed in these races. I should be thankful that I have been able to run all these years. I should be grateful that despite the hamstring injury and missing two weeks of training, I was able to run these two races and place in them. I am grateful for all of my amazing friends who have come into my life as a result of running, so thankful for the incredible support of my husband and family over the years, and grateful for all of the athletes I coach. I just need to remember to be grateful for the fact that I must have some running in my genetic code and that I am ABLE to train and race at the level I do. Running is a gift. Second marathon in my mission to join Marathon Maniacs. 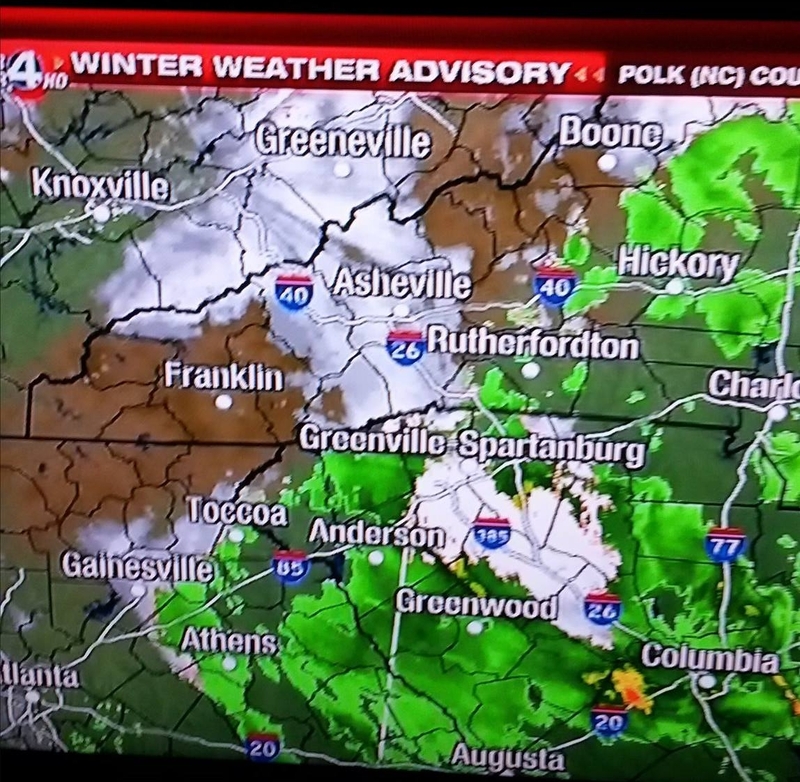 With an 18 miler one week ago, a 30K trail race two weeks ago, and a marathon three weeks ago, I knew trying to race Space Coast Marathon all out would not be wise. On top of that, I was sick for the past couple of weeks and my goal marathon is about eight weeks away: Inaugural Celebration Marathon. To join Marathon Maniacs, the minimum to become a member is to complete three marathons within 90 days. My plan for Space Coast was to run comfortably around 8:40-8:45 pace to start then speed up and run negative splits. It has been so long since I have run negative splits and been able to finish strong in a marathon, I needed to not only remind myself but almost relearn how to pace myself early, hold back despite feeling good, and stick to a race plan. I was tempted by the 3:40:00 pace group and the 3:45:00 pace group. I could join the group and just hold on letting them do the pace work. But as a bit of a loner I decided to run my own race. I started out comfortably, letting the 3:40:00 pace group go by me. My Boston Qualifying (BQ) time is 3:45:00 now that I moved up to the 40-44 age group. 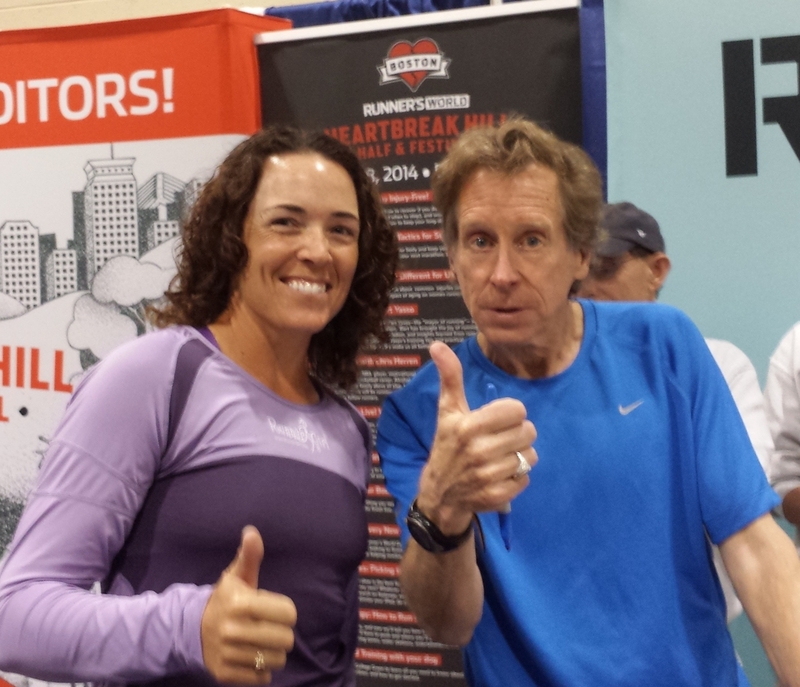 In my mind I thought it would be nice if I ran a BQ and was able to stick to my race plan. At times during the first half I could hear the 3:45:00 group talking behind me but luckily they stayed behind me. The first half of the race was comfortable which ended up being 8:30-8:40 pace and with the few rolling hills I clocked a few miles around 8:16-8:29 thanks to those down hills! I focused on hydrating, taking Gu every 45:00 or so, running comfortably, and happily watching my Garmin click off a nicely paced first half. At the halfway point we pass by the start/finish area so there are bigger crowds. The cheering and excitement of this area was where I picked it up too soon when I ran this race in 2011. Throughout the race I kept smiling and reminding myself of what I was trying to accomplish – a strategically paced race with negative splits. Once I hit mile 16 and then 18 I reminded myself again to stick with the pace. I told myself that once I reached mile 20 at the turn around I could let loose. I liked the fact that this was an out and back course because I was able to count all the women who were ahead of me by the time I reached mile 20. Once I started on the way back, my goal was to pass as many of them as possible. There was a fairly strong head wind on the way back (last 6 miles) so I just focused on my targets ahead and did not worry about pace. I was having fun! I was tired but still felt strong and despite looking at my Garmin less and less I knew I was running faster. I must have passed at least 10-15 female marathoners in the last six miles. It was not always easy to tell because there were half marathoners on the course and some other women who were just out for a trainng run too. I don’t know what all my splits were towards the end but mile 24 was 7:56 and mile 25 and 26 were 8:05. I definitely ran negative splits, finished strong, ran a BQ 3:40:39, finished 4th in my age group and 21st overall female. I did not win anything or run a PR (technically it is a masters PR but I won’t go into that right now). I was so happy walking around the post race party area with my husband because I successfully executed my race plan, finished strong, and ran negative splits. Victory can have so many meanings. 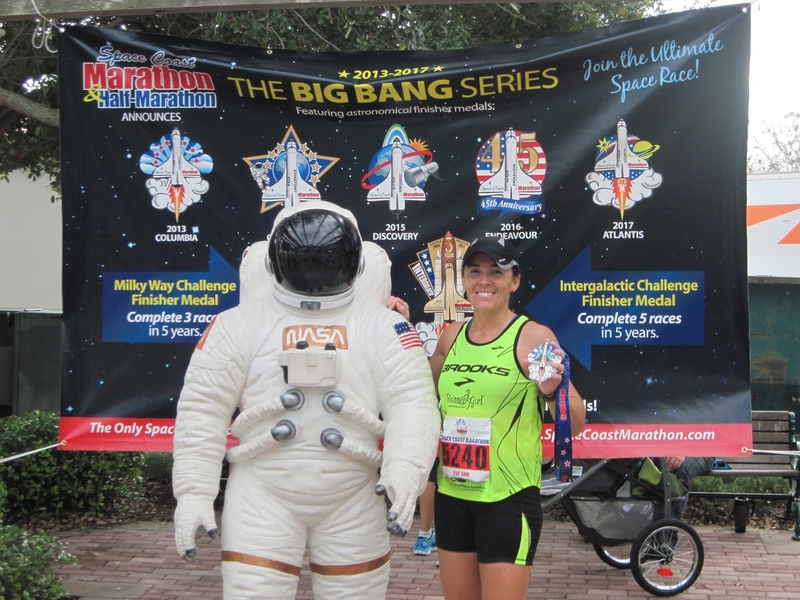 I would definitely say the Space Coast Marathon was a mission accomplished! Back in January I was training on my hybrid marathon training plan which combined long runs, several races, hill training, and speed work. The week ending January 15 marked my “highest week ever” (noted that way in my training log) with 63.25 miles. 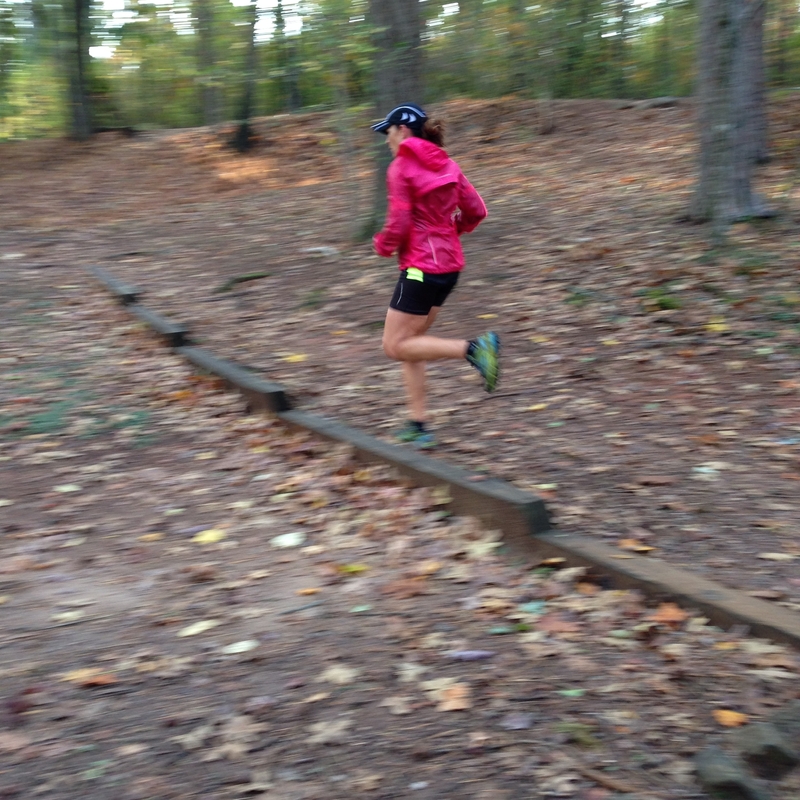 Highlights of that week included a hill workout, 22 mile long run, and a decent 10K race. 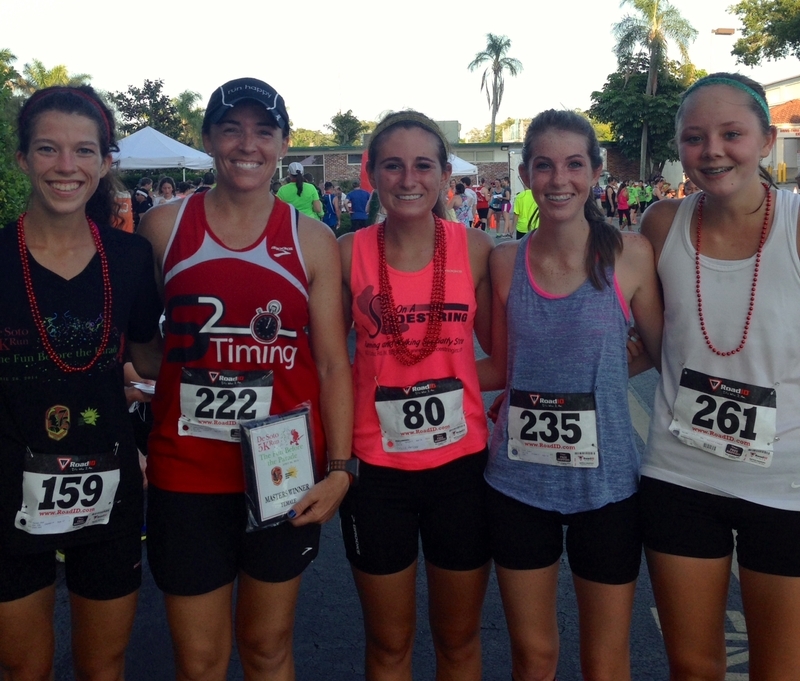 My previous blog entry goes into great detail about the January 21 Ringling Bridge Run. The week ending January 22 featured a 9 mile speed workout, some hill sprints, and the 26.2 mile run with the race in the middle. That week ended with 57.45 miles. I am going week by week for a reason here. I wanted to share my build up to the February marathon so you can see the crazy hybrid training schedule I concocted. Last week of January I totaled 49 miles with a tough speed workout (600s!) 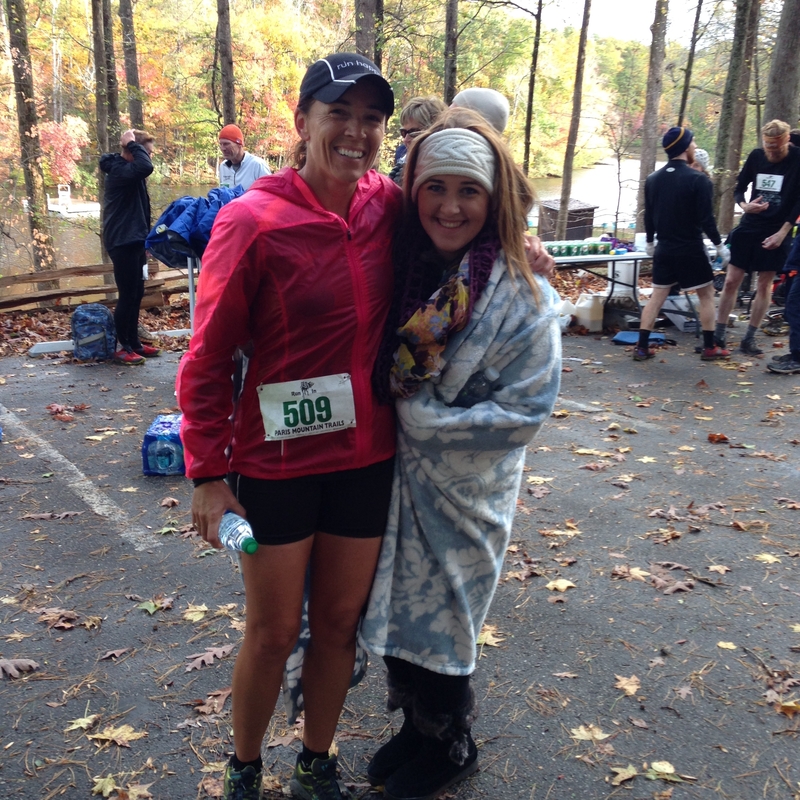 and one of my best races in a while – the Newnan’s Lake 15K in Gainesville (6:55 pace for 9.3 miles) which was followed by a 22 mile long run the next day. Exhaustion was setting in but luckily it was taper time! First week of February I had another good quality speed workout (800s this time), some 400s uphill, and took first overall female in the Run for the Manatees 5K. Only 39 miles this week. I was having some major IT band pain so I decided to switch to shoes with a little less stability to see if that would help. 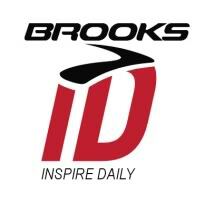 I normally train in Brooks Adrenaline and decided to try the Brooks Ravenna. Probably not the best idea a couple of weeks before my marathon but I didn’t know what else to do at this point. I stretch, get massage regularly, and had acupuncture. Taper time! I do not handle the taper very well. But who does? The week ending February 12 totaled 34.25 miles with a tempo run, a couple short runs at GMP (goal marathon pace), and the St. Pete Rock ‘n’ Roll Half Marathon which I ran at GMP. It was tough to hold back during this race but I knew if I did not, I would ruin my chances at a decent marathon next week. All this week I ran in the Brooks Ravenna (less stability). Marathon week! After two and a half weeks training in the Brooks Ravenna, my IT bands felt better but my left hamstring and TFL were so painful. So bad that I decided I better run the marathon in my good old Brooks Adrenalines. 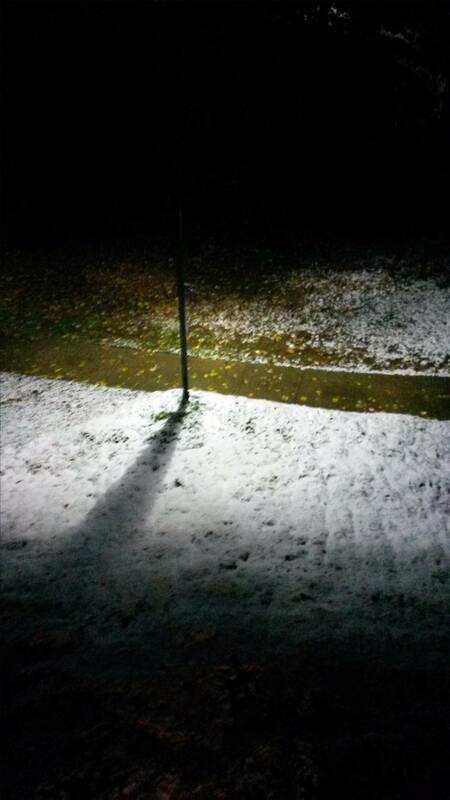 Race conditions were not ideal for the Five Points of Life Marathon in Gainesville. It was super windy, extremely humid, hilly, and a small race so I often found myself alone with no one around to even think about drafting. I felt very good through halfway and was exactly on my goal pace at 20 miles but that’s when the good feelings blew away with the strong wind gusts. My pace slowed every mile from 20 to the finish. I even had to walk in the last mile. 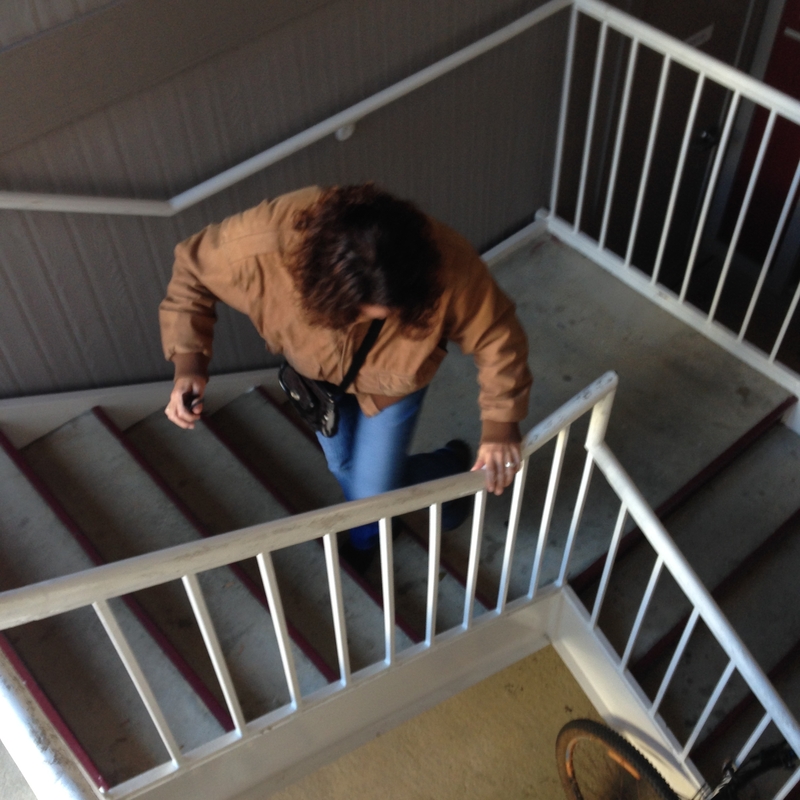 I felt awful trying to ascend the final incline before the left turn to the finish line. I know I looked as bad as I felt from expressions on the faces of my husband and friends at the finish. My goal was to finish just under 3:30. For some reason 3:30 has been a weird barrier for me in my last few marathons so I wanted to break it. I finished in 3:39:46. Of course I was disappointed. I felt like I had trained so hard and so well for this. After I walked around for a while and came back to see the posted results, my mood immediately changed. The winning female time was 3:20. I was the second overall female and won $450! After a week or so of recovery, I closed out February and started March with 30 miles including an 8 mile speed workout, a hilly trail tempo run, and the Gasparilla 8K where I finished 3rd overall female. Since the marathon I had been back full time in my Brooks Adrenaline with no IT band pain but still some lingering left hamstring and TFL tightness and soreness that just would not respond to anything. 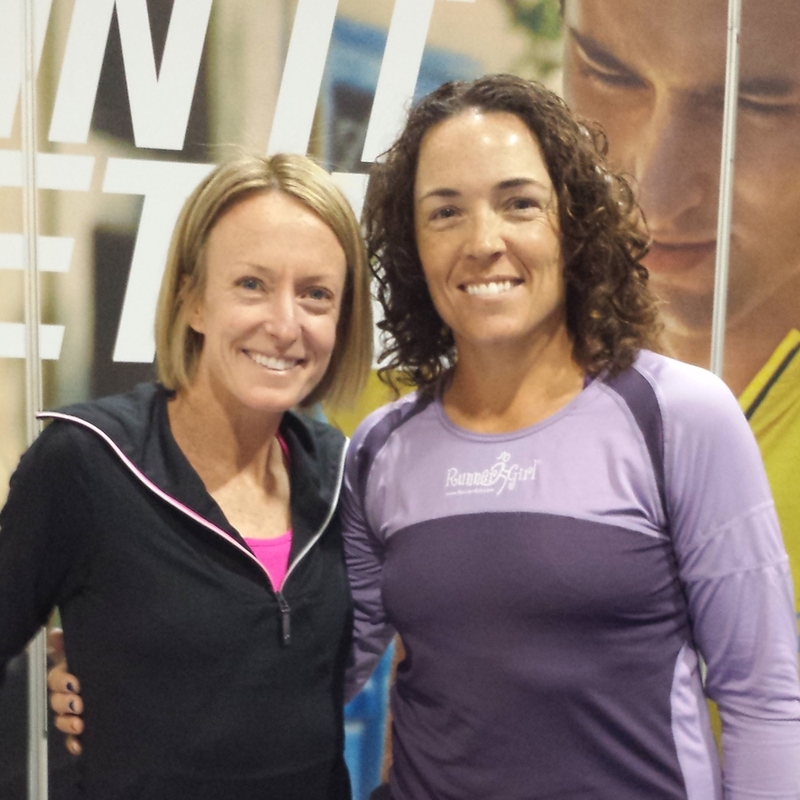 On March 11 Team RunnerGirl won the female division of the Sarasota Half Marathon Relay. I ran the first leg which was about 6 miles and included the Ringling Bridge while my relay partner Kali ran the longer second leg. It was our second relay together this year and this time we took home the gold. What fun! 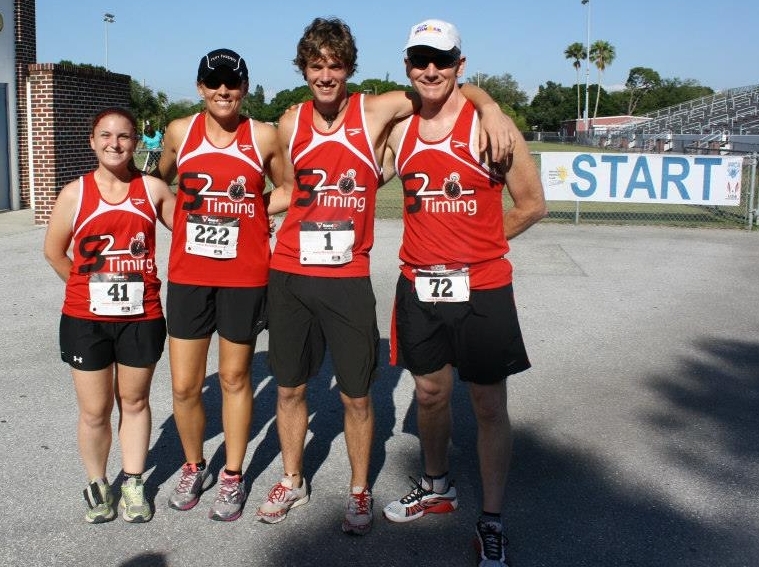 We had such a great time at this race with so many of our running friends from Team RunnerGirl – On A Shoestring – Brooks as well as Suncoast Striders and many of our local high school runners. 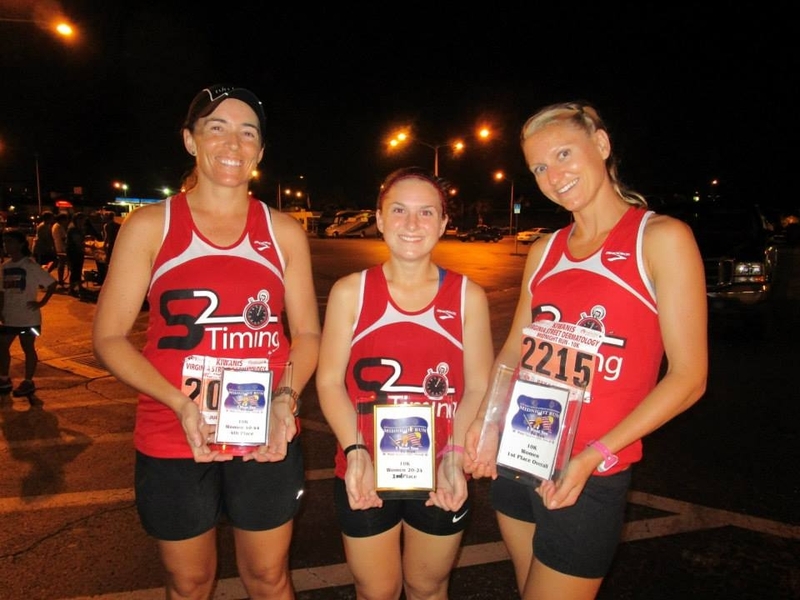 Most people know this race as the Ringling Bridge Run 4 Miler which is the biggest local timed/scored race in our area. It’s mind boggling year after year to see more and more people who want to race over the Ringling Bridge! I mean, I love hills and bridges, but people think I’m weird. It looks like there were 2,158 finishers in the 4 miler this year. I have no idea how many participated in the one mile. But it’s for a great cause and the money stays locally so it generates great community support. 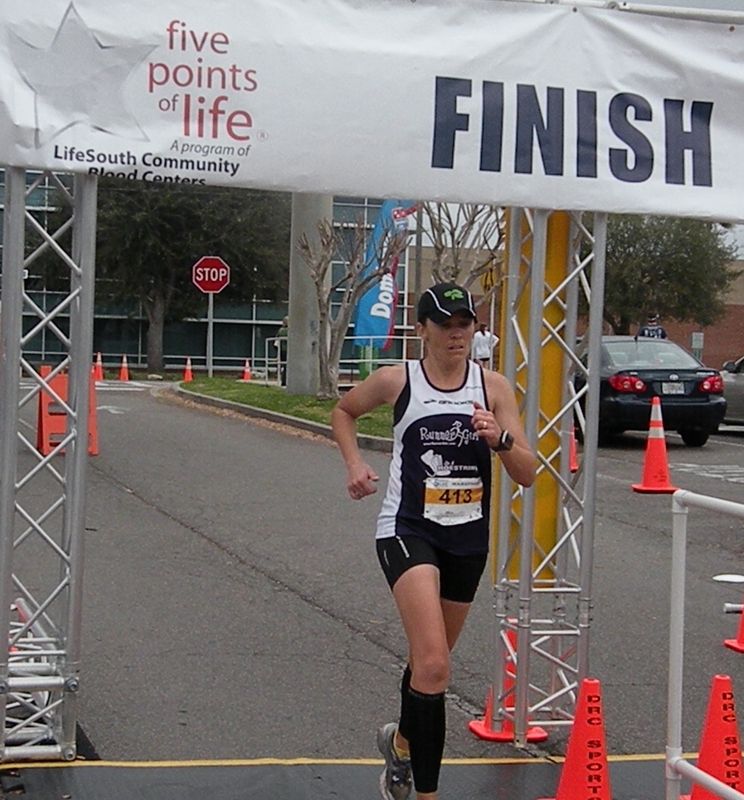 I ran the Space Coast Marathon on November 27, 2011 then took a couple weeks of rest and recovery before deciding to sign up and train for the Five Points of Life Marathon on February 19, 2012. That didn’t give me a lot of time to recover, start training again, get in all the long runs and workouts I wanted to, and fit in all the other races I had already signed up for in January and February. So I created the best possible training schedule I could with all the weekend race commitments I had already made weeks and months earlier. This brings us to the Ringling Bridge Run 4 Miler and the Saturday I’m supposed to do my longest long run of this hybrid marathon training schedule. So I combine the two and am very happy with the result! I ran approximately 8.5 miles before the race then raced 4 miles in 27:09 (6:47 pace) which is 12 seconds slower than my PR. Wished I realized that during the race so I could have gone for a new PR! After the race I had some Gu and water then set off for my 14 (approx.) mile “cool down” with water and Gu stops throughout. I averaged 8:55 for the 26.2 miles and went over and back on the Ringling Bridge (biggest “hill” in this area) four times. 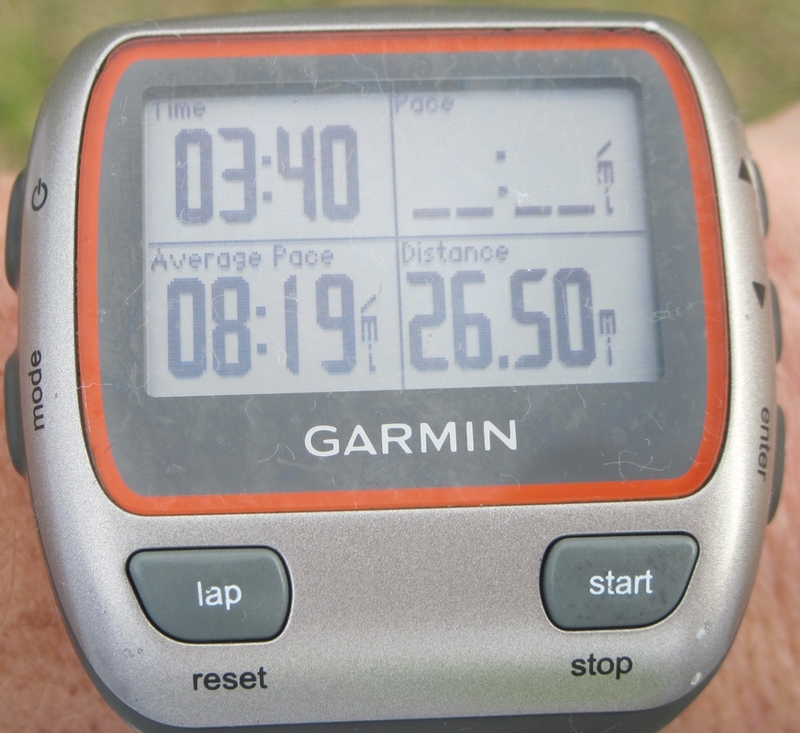 This was the second time I had done a 26.2 mile training run. I decided this was important to do again for this February marathon because I recovered so quickly from the November marathon. Oh and did I mention the rolling hills I would see in the February marathon? Luckily I have this hilly 26.2 mile training run under my belt and have been doing weekly hill workouts since last fall.